There are cases when highways are laid out at the expense of existing frail connections of particular areas. Prof. Dr. Ir. Sedyatmo toll road which connects Jakarta and Soekarno-Hatta International Airport, for instance, separated the vast and living space in Cengkareng. The solution was building crossing bridges available to transport people and goods on motorcycles. A similar case is the highway that connects Jakarta with Bandung. Commerce in Bandung took a great benefit from the direct access to the capital, in which travel can now be made possible in just two hours. But some sections of the highway had to cross exisitng villages, splitting them into two sides. Due to the characteristics of an area—size, interaction, and movement—seeking generic solution of building bridges does not necessarily replace accessibility like it used to be. A man heads home by trespassing the toll road on foot, a dangerous habit to his daily commute. But interestingly, people always have the ability to adapt with changes in their living spaces. Such a land-conquest merit in the modern context is clearly shown in the way people make access to move around, finding means to support their homes, trade goods and services, and so on. 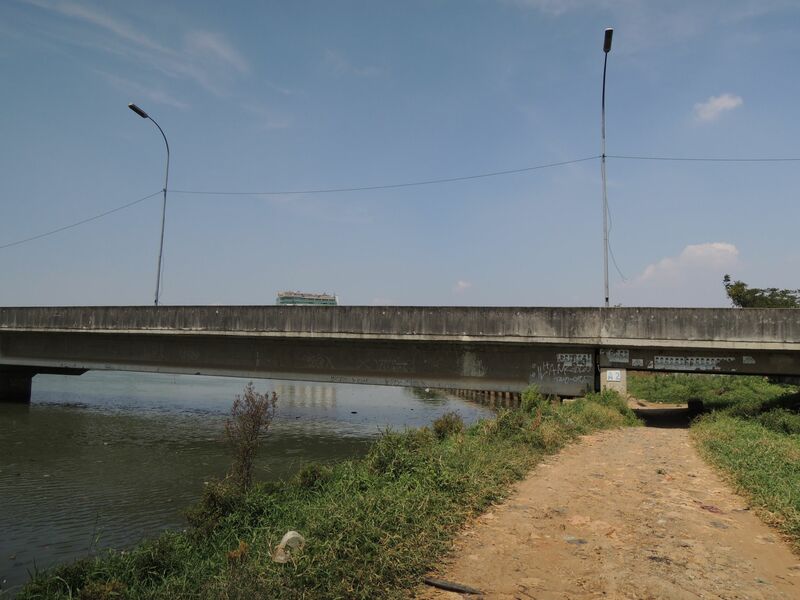 In Kapuk, one of the areas that constitute Cengkareng district, North Jakarta, a long section of highway crossed by without an off-ramp. This backyard of Kapuk can be described as the deserted area by the river where housing is unorganised, wild plants grew naturally, and access to anywhere cut-off. 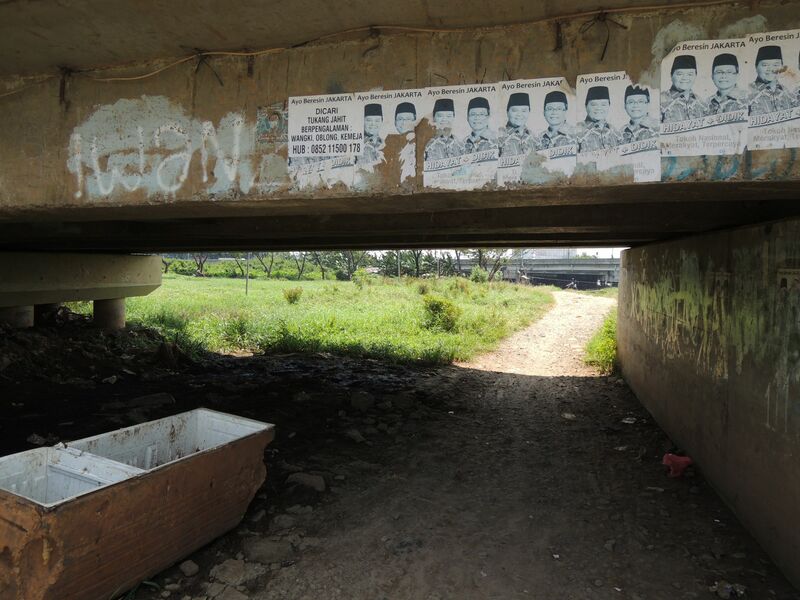 And the surrounding people at the dead-end part of the village managed to create a way of their own, a reliable dirt road passing under the highway, capable of getting them on bikes to main avenues at the west. This is one of the few open and unmapped networks in Jakarta. Talking about the integration of city transportation modes, one can find an extraordinary case in the backyard of Kapuk that will let many engineers dumbfounded. This is an example of an actually functioning and time-tested integration of land and water transportation means. 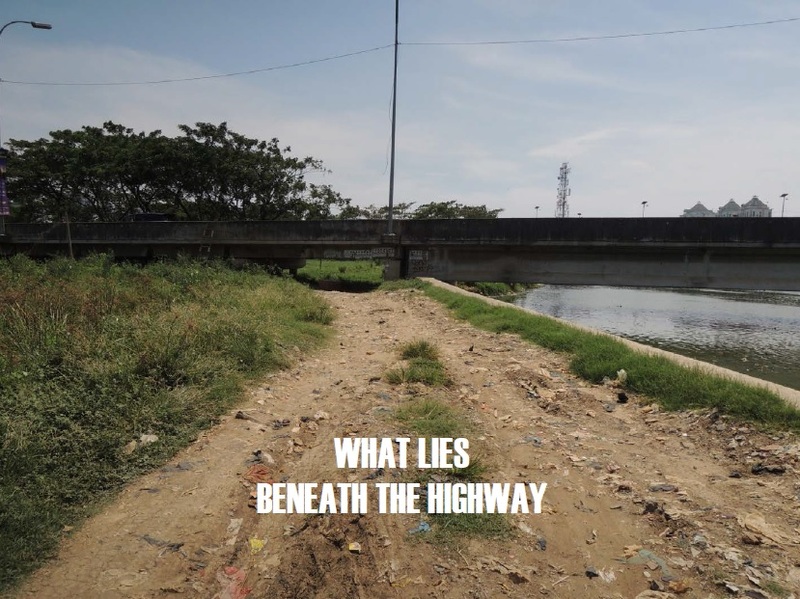 The less than 100 meters length of dirt road will end up at a riverside. A man in his usual working day offers river-crossing service by boat where two ends of the rope are tied on the two sides of the river. Crossing from one side to another is made possible by relying on manual labor. An alternate road that cuts the distance to and from the poor and heavily populated area of Kapuk. A small passage under the highway.